The Studded Brown Buckle Belt is a simple yet functional belt that features an attractive and decorative buckle on a hand-crafted 100% quality leather belt. This belt meshes well with almost any look, and can even be used with contemporary styles. This attractive belt is dark brown in color and features a repeating pattern of paired round studs that decorate the length of this belt. 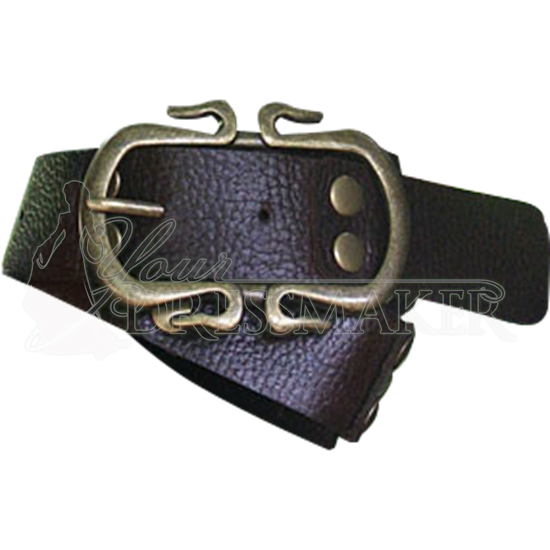 The buckle, while decorative, is still fairly simple. The simplicity of the belt allows the details of the belt to truly shine through. The belt is only available in brown, but comes in four sizes. Make sure to order according to your waist size to ensure the proper fit. Like any good buckle belt, this one is adjustable. It will also perform marvelously when used to hold up medieval accessories, like weapon frogs, tankard strips, belt bags, and all manner of other accessories. But it is not just a medieval belt. 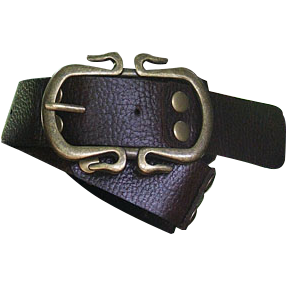 The style of the Studded Brown Buckle Belt is so universally sleek and stylish that this belt works just as well with contemporary looks as it does with medieval, renaissance, and fantasy styled looks.